Time to Eradicate the Academic Jerk? There have been several articles/blogposts recently pointing out that scientists are just like everyone else. For instance, they have emotions (see this Observer article from last week detailing the ups and downs of research life); and they get stressed, as fellow Occam’s Corner blogger Stephen Caplan pointed out, just like people in any other career. It is perhaps a bit sad that it needs to be stressed that scientists aren’t a breed apart, but the world – in particular the media – do seem a bit inclined to regard us as ‘different’. Unfortunately, if we are just like the rest of the world, that includes the fact that a certain proportion of us are also bound to be jerks. A recent post by Thesis Whisperer asked if you get further in academic life by being a jerk. I don’t think this simply referred to scientists, but it certainly would include them. It provoked many, many comments most of which certainly recognized the ‘jerkiness’ of many of their colleagues, but not all of whom agreed this was the way to get on. I think this observation is also mirrored by office politics anywhere. Nevertheless, if you want a concrete example of a spectacularly successful scientist who is anything but a jerk, look in this week’s Observer for the profile of neuroscientist and autism expert Uta Frith. 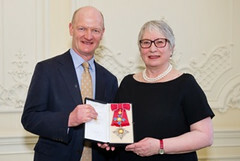 A couple of weeks ago, when I was fortunate enough to attend the ceremony at which David Willetts conferred an Honorary DBE upon her, I learnt that Uta is a Fellow of three national academies (the Royal Society, which is where I have met her as her field is far from mine, the British Academy and the Academy of Medical Sciences); she is also married to a man (Chris Frith) who is himself a fellow of the first two of these. She has a ‘family’ of many successful ex-students (as well as a family in the conventional sense) who clearly see her as a wonderful mentor and friend: I know because I keep bumping into these women (unusually, all women as far as I recall) and they tell me so. As the Observer succinctly put it ‘Lack of empathy is not something Frith suffers from herself’. My own personal experience tells me that too. Uta is the exact opposite of a jerk, a wonderful role model, inspiration and friend to many, and it clearly hasn’t held her back. Despite this obvious counter-example, academia obviously does have its fair share of jerks. The question is, can we do anything about it? I think a crucial first stage has to be to seek out ways of not rewarding the selfish, the loud-mouthed, the bad-mouthed and the downright nasty. We’ve all met characters like that, but if progression up the greasy academic pole required a fair smattering of good citizenship, demonstrated leadership of others and not just looking after your own little clique coupled with oversight of your personal but perhaps ill-gotten research grants, gained by doing down competitors, then maybe jerks would start to diminish in number. It does seem to me to be entirely possible that good citizenship can, in some shape or other, be amongst the criteria for promotion; my own university is certainly pushing it up the list of attributes required. Historically, research success has tended to be the most important criterion, trumping anything else. Teaching was traditionally seen as a poor relation for a fast rise up the ladder, and that is bad enough. The ‘general’ contribution often hardly got a look in. Yet every academic department would grind to a halt if that ‘general’ stuff was done by nobody. It may include admissions, student liaison, mentoring of early career staff or working on the inevitable assessments – RAE, REF, TQA that kind of stuff familiar to the UK community; it shouldn’t be beyond the capacity of anyone to contribute something useful on some front or other. But many jerks perfect the art of such uselessness that they end up escaping what may seem like chores by their apparent complete ineptitude. This incompetence, of course, immediately disappears when it comes to something they actually want to do, like write a grant proposal or attract the brightest research students of the year to their own group. Such behaviour is very transparent. It should be obvious to any promotion panel when individuals play this game. If such jerkish behaviour ceased to be rewarded in ways the jerks believe it should be, then maybe, just maybe, we would see a diminution of their numbers. And if jerks weren’t succeeding it would seem likely the next generation would realise that misbehaviour of this sort doesn’t pay dividends. That, as a grad student, trampling on those around you, nicking their apparatus without a by-your-leave and bad-mouthing other students’ presentations, was not the way to win favour and move a notch up the scale. Maybe we can make it a message that those with latent bad behaviour can pick up early enough so that they are able to stamp on their own failings before they are too deeply embedded in their psyches. I think this is certainly a case where strong leadership by example, by departmental senior management teams, might make a big difference. Unfortunately, the current world can too often have departments in which the worst offenders hold too much power, too much money and have been securely established as the departmental golden boys (or girls). They have achieved this by virtue of the fact that they get their way in the world by their brutish behaviour and so acquire the resources necessary in order to make yet further progress. But a few committed senior individuals creating, as the Thesis Whisperer put it, an explicit Circle of Niceness could yet work wonders in transforming each individual department and hence the wider world. Office politics are no different in academia than in Ricky Gervais’s Office. What is different is that academia relies on competition. The idea that the ‘best’ will rise to the top and the failures will drop out holds more currency in academia than in the average open plan suite of rooms of a Prudential or Marks and Spencer’s office. Nevertheless, we could try to redefine some parts of what ‘best’ means to include a little more humanity, give space for more emotional engagement such as in support for others, and an appreciation of service to the community and not just self. I’m with Thesis Whisperer on the importance of valuing niceness and not acquiescing in bad behaviour, wherever it rears its ugly head in our universities. This entry was posted in Science Culture and tagged acadmia, good behaviour, leadership, Uta Frith. Bookmark the permalink. 16 Responses to Time to Eradicate the Academic Jerk? The trouble is, Athene, that in an academic landscape dominated for the last two decades by the RAE and now the REF, getting grants is everything, at least in the sciences. Thus grant-getting has always far outweighed everything else in promotion selection. It has rarely been possible to get promoted by being a ‘good teacher, good citizen and colleague, and OK if unspectacular researcher’. I’ve hardly ever seen it, anyway. And in my experience the ‘good citizenship’ aspects are far more, errrm, ‘prevalent’ among the less ‘research-superfocussed’ staff – so in that sense they are selected against, if anything. I can’t see this changing much whilst we have the REF. While the current dependence of the finances of UK Universities on student fees has certainly made Univs (and Departments) re-think their attitude to teaching somewhat, the main outcome across the Russell Group has been to create (overtly in some places, more stealthily in others) a separate teaching-focussed job track. However, this is usually ‘teaching and pedagogic scholarship’, rather than ‘teaching and a bit of research’. The re-valuing of teaching has not, as far as I can see, helped many people with teaching-heavy portfolios ascend the traditional promotional track. i am blushing, Athene. However, I must point out that it is you who is an example of non-jerkiness+success. As for me – my wonderful friends and ex-students know only too well, that deep down I am just as nasty and waspish as the next person. Ironically I study social cognition and nastiness/niceness is one of the conundrums that fascinates me. The discussion Athene is contributing to reminds me of the problem of free riders. Here a number of empirical studies exist and we know a little about how they appear and how they sometimes can be made to disappear. Suffice it to say anonymity and sanctions are key factors. As a reminder: sanctions can be loss of reputation. Presumably we all have propensities for nice and nasty behaviour, and we are not always in control of which way to go. in some contexts we are highly competitive and selfish, but in other contexts we are spontaneously prosocial. Most of the time we are unconsciously primed to do what others do. This priming is also what allows a circle of niceness to grow. Someone has to start and others will follow. I am probably naive but networks where people can trust each other are a nice thing and they breed niceness. I don’t think being waspish is inconsistent with being a good citizen. It is inevitable in academia sometimes disagreements may flare or a colleague or student is heading in a wrong research direction and needs sorting out. Short tempers may manifest themselves. But that is not the same thing as deliberately or even maliciously doing things selfishly and self-importantly, which is much more how I would define a jerk. LIke you my colleagues would recognize that I can be sharp-tongued, to say the least, when push comes to shove, but I don’t think that is incompatible with being supportive at other moments. The fact remains you shine an enthusiastic and supportive light on those around you, at the very least much of the time! Excellent post which should be force-read to every senior university manager, with follow-up sanctions until they do something positive. It’s as much academia as science, though. I’ve a friend in the humanities, currently a senior lecturer, who suffers from the career-threatening combination of being nice, competent and conscientious. Boy does she get put upon, while the jerks slide out from under their assigned tasks and so get more time for research. The promotion criteria in her department are entirely about research, and the managers don’t seem able or willing to enforce good behaviour. So it’s hardly a surprise that the upper echelons of that university have quite a few jerks. My question is: how, other than by becoming more jerkish herself, can she do anything to change this situation? I completely agree with you. I try to be a decent and relatively nice person from day to day, and seeing some really unpleasant people zoom by me career-wise simply because they publish more or get more grants in, is something that is really starting to grate (thankfully there are also plenty of wonderful people who do very well too!). I do wish there was more of a culture of calling people out on their bad behaviour – this is entirely absent as far as I can tell and it’s something directors and professors should set more of an example in. @Neurotaylor: I think there is a difference between being a jerk and being selfish. You can look out for yourself, not let people dump menial tasks on you, and not invest time in work that you won’t get credit for, without being nasty about it. Elegantly learning to say “no” or even “f*** off” is a really important skill in life! @Sarah You make it sound so easy! I agree that saying “no” is a useful skill, and my colleague says “no” more and more, but when your head of department dumps stuff on you because otherwise it won’t get done, and you know that, and you know it needs to get done because if it doesn’t your life will be made harder, it can actually seem both easier and rational to just do it. I think Athene’s right, this is in large part a leadership issue. My question is: how do the non-leaders put pressure on the people who will be on their promotion panels to show that leadership, given that what senior academics (in my colleague’s department at least) want most of all is less hassle? I think it’s also a workload issue. My colleague worked every day of the Christmas ‘vacation’, does evenings and weekends, and that’s just to keep up with teaching and admin. Research? Forget it. I assume the nice senior people are in the same position, at least partly because of their free-riding colleagues. When you’re running so hard to stay still, how can you be expected to tackle something as stressful as calling out jerks? Especially when there’s no backup from higher up the food chain. It’s great that these things are being said. It’d just be nice to have a little more guidance on how they’re to be done. Sadly as you say, ’tis the same everywhere. I hear many individuals NGOs are cut throat under all that do gooding! Maybe we need to ‘codify’ it a bit more so that individual traits of niceness which support the overall growth of a culture of niceness can at the very least be identified so they can flourish! In that way, as you say, instead of penalising the jerks, they stand out a bit more as being the jerks that they are. Perhaps there are more examples of niceness out there than we really realise and they can be sought out, and acknowledged more, whilst ignoring the bad behaviour. I did a blog once about management lessons from childcare – celebrating the behaviour you want rather than dwelling on the behaviour you don’t is the major theme of modern childcare, and it actually works! I was pondering it in the business context a little while ago when trying to build the ‘business case’ for responsibility in business. Perhaps someone should write an academic version of Linda Kaplan Thayler’s The Power of Nice: How to Conquer the Business World With Kindness! Lovely piece. But it made me think of what we were discussing the other night, and the different ways of prioritising “things to do”. I never feel that I have enough time to do half of what I should, and I can’t contribute to the “general” nearly as much as I’d like to. I think that many examples of jerkiness result from people being tired and stressed and under pressure, as a result of the fairly difficult financial environment that universities now find themselves in. It seems that the elephant in the room is that everyone is now being asked to do three or four jobs (all of which could be full time), and it’s just assumed that the answer to every problem is for everyone to do more of everything. Academia needs to acknowledge that it is not physically possible for every individual to wear every hat at the same time, but also to value good people whatever hat they’re wearing. Looking ahead of me in the system, I’m always impressed that jerkiness isn’t worse, given the utterly ridiculous pressure my seniors are under. Really nice post. I’m encountering more and more of these type of people and it’s quite encouraging to see someone of Athene’s stature writing about this. I agree that it would be good if we could change how we judge academics so that it’s harder for “Academic jerks” to get away with doing some things so badly that they can engineer to spend more time on what is currently rewarded (research outputs and grant funding, for example). One big issue – as you point out – is that Academic leaders typically ignore this behaviour and allow these “Academic jerks” to get away with behaving badly. I think this is the biggest issue and if the Leadership isn’t willing to address this type of behaviour, it will be extremely difficult to do anything to solve it any time in the near future. Unfortunately I would agree with Ken – this does seem to be on the rise with an apparently ever decreasing pot of funding and people keen to get as much of it as they can. I also agree with you on leadership. It should be the senior people such as Professors who help along the more junior members of staff in supporting their applications, mentoring their way through the system. I have encountered a couple of instances recently of “jerks” who appear to be only too keen to squash the ideas of others, only to take it for their own means. Sad, but it does happen, but sometimes we can misjudge people’s motives. The best way I think is to “play a straight bat” and not try to second-guess the motives of others. Focus on the science and the problems and less on your ability to outwit your supposed nemesis – they may or may not exist! Sure, jerks exist but you often find that in the small world of academia they can’t carry on behaving in this way for long. P.S. My eldest child has autistic spectrum disorder so I may have to look up some of your work Uta. FIrst of all I think any university that cared to do this could help by making it a requirement that individuals HAVE to demonstrate some form of good citizenry before they are promoted; that having a fantastic research income is not enough on its own, however good it is and however good the publication list is. I have seen this happen in my university where an otherwise stellar applicant was denied promotion until they could demonstrate something under the ‘general’ heading. And this person wasn’t a jerk, but had simply been keeping their head down. Nevertheless, the more such stories get out, the more the conscious jerks will have to think about their patterns of behaviour. Secondly, the fact that it is hard to say no or even to know what thinigs should be turned down and what would be good to do can be helped by some mentoring, official or otherwise. But a workload model may also help, at least within a department, to indicate who is being dumped on and who is getting off scot free. I’m with Hilary that if what constitutes good behaviour can be identified, labelled and put into a framework it may help everyone. As for how these changes can be brought about, the more senior ‘nice’ people can certainly do their bit by pointing out the necessity of changes to the leadership; and the more junior can perhaps do the same during appraisal interviews etc simply by raising the issue as something that troubles them. If enough people head in the same direction it might, optimist that I am, facilitate the culture change that is needed. I couldn’t agree more Athene. Perhaps to have a section on ‘Demonstration of collegiality’ in the promotions criteria would be a good thing. I don’t think that the ‘jerk’ often realises how damaging their behaviour can be to a department’s vitality. Until the selection and promotions panel members and senior leaders are replaced by nice people, sadly, I can’t quite see how things can change. All the systemic oddities and misplaced values are very much real, but I believe that people do have the power to transform the systems and make the whole environment better. The only problem is, of course, in most areas we don’t have the right people in the right positions. A wonderful blog in genre, style and content, that I feel lucky to have bumped into today. Two points to this post on academic jerks: First, you seem to idealize academic competition. This is a process, as you certainly know, as unfair as other types of competition in society that nearly inevitably will succumb to the non-linear dynamics of “the-rich-get-richer”. This makes it harder move ahead when you are kind. But not impossible. Second, I had thus started a social self-experiment when I was in medical school and one day, on a trip to the U.S., first heard the saying that “nice guys finish last”. that it is possible to “be nice and finish first”. Motivated by my wife, in my role as mentor my current question is whether some of the survival mechanisms I have developed in testing the above hypothesis is of any utility in helping to alleviate the problems that woman face in academia. Worth another experiment.